Our favorite festive Chinese New Year is less than a month away! It’s a season that all the families and friends reunion together for food and gifts! So have you planned what gifts to get for your families, friends, relatives and business partners? Do you know that? 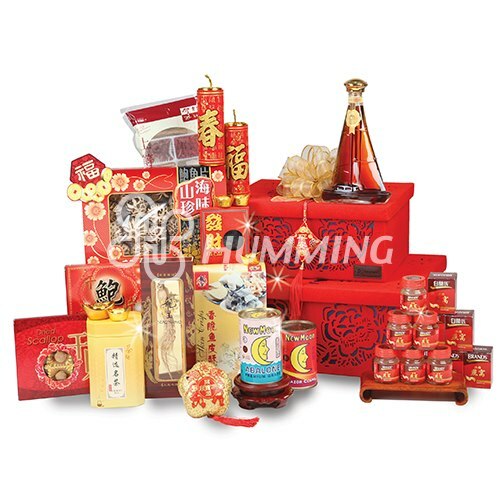 Humming Flowers & Gifts has revitalizes its popular range of Chinese New Year hampers with exclusive and new packaging designs coupled with quality food products for this year 2013 CNY Collection! I am so excited and happy to receive this Exclusive Auspicious Luck 2-Tier Gift Boxes worth ($138)! Have you seen hampers looking this gorgeous? To my surprise, these gift boxes are beautiful! It’s totally different from those tall evergreen hampers we usually seen in the market! I mean I understand those evergreen ones are still a hot favorite among business associates but look at this! This makes a very good hamper for family and friends. I’m sure anyone who receive this Prosperity Twin Blessings 富贵双喜 range of gift boxes, they will definitely surprise by the carvings design and love every bits of it. You can even use this boxes after CNY and use it to store your beauty products, snacks and more! So what are the items inside my Auspicious Luck 2-Tier Gift Boxes? It will be an awesome add-on for our reunion dinner this year with Skylight Premium Braised Shark’s Fin and Fishmaw! Toast for a great year ahead with Chateau Millaux Bordeaux Red Wine! Thank you Humming Flowers and Gifts! Humming also include an Exquisite Hand-painted Prosperity Musical Blossom which can activated by motion sensor in each hamper! I’m going to use it as one of my CNY decoration and surprise my relatives with the Joyful Chinese New Year melody and greetings! I am certain this will help liven the CNY mood. Besides Auspicious Luck (Worth $138), Humming offers another 4 selections “Prosperity Twin Blessings” ranging from $228 to $298. Bringing plenty of luck home or as the perfect gift brings abundance luck to one and others. Twice the prosperity, wealth and luck with a whole lot of festive delicacies and goodness packed together in our lucky red gift boxes! Like Humming Facebook for updated news and promotions! Good News for all my readers out there! Humming is giving my readers FREE delivery service worth of $6.42!!! Simply quote ‘TBSCNY’ and enjoy FOC delivery!